Bundles of Fun with Peaches & Plums! Food literacy is about developing positive attitudes, skills and knowledge about food. Children learn through all 5 senses (touch, smell, sight, hearing, and taste). 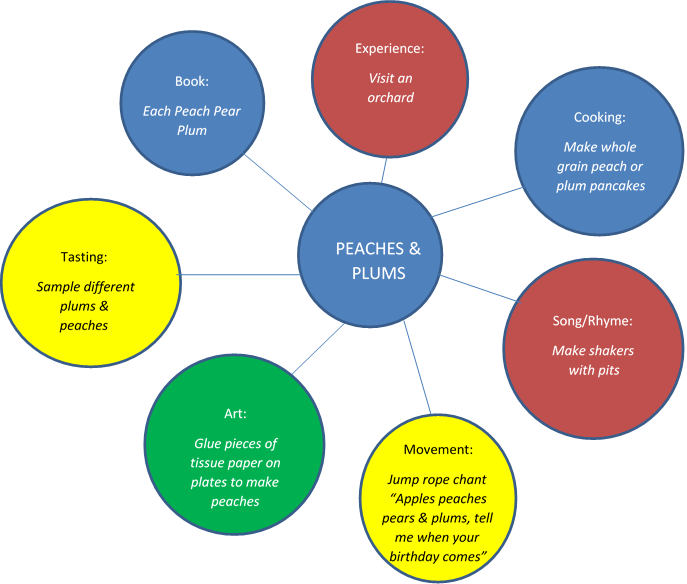 You can use a defined theme, like Peaches & Plums, and incorporate several of the senses to help children learn about food…and it becomes a bundle of fun! 1. PROVIDE FACILITATED AND UNSTRUCTURED PHYSICAL ACTIVITY AND OUTDOOR PLAY EVERYDAY. 3. CREATE INDOOR AND OUTDOOR SPACES THAT SUPPORT A VARIETY OF PHYSICAL ACTIVITIES.